A scene from NASA's Comet Quest iPhone game, which lets players steer the unmanned Rosetta spacecraft toward a rendezvous with a comet. Ever wanted to steer a robotic spacecraft toward a comet rendezvous in deep space? Now there's an app for that. NASA's new free iPhone game Comet Quest puts players at the controls of the European Space Agency's Rosetta spacecraft, which is slated to arrive at the comet 67P/Churyumov-Gerasimenko in 2014. The real Rosetta will drop a lander onto the comet's nucleus, then spend roughly two years studying the icy wanderer from orbit. Comet Quest parallels the actual mission. 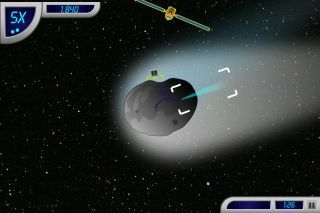 Players must deploy a lander in a scientifically interesting area; receive data from the lander; transmit lander and orbiter data back to Earth; and keep Rosetta safe from dangerous chunks of material blasting off the comet's surface. Comet Quest, which NASA released on Feb. 29, is meant to be fun, but it strives to teach above all, according to the game's developers. "Of course, since it is a NASA-sponsored app, education is its true raison d'être," Diane Fisher, of NASA's Jet Propulsion Laboratory in Pasadena, Calif., told SPACE.com via email. Fisher is webmaster for The Space Place, a NASA website that aims to engage elementary-school students in science, technology and math. "[Comet Quest's] goal is to provide an enjoyable means to learn about the Rosetta mission through action gameplay where the player takes the role of Rosetta's mission operator and tries to capture and record as much science data as possible," Fisher added. Comet Quest is available for free at Apple's app store and is compatible with the iPhone, iPod touch, and iPad. NASA is considering an Android version of the game but has set no timeline for when that might happen, Fisher said. Rosetta - the comet chaser. An artist's depiction of Rosetta's arrival at its comet destination. The $1.4 billion Rosetta mission launched in March 2004. The spacecraft has been doing some interesting science on its long journey to the 2.4-mile-wide (4-kilometer) 67P/Churyumov-Gerasimenko. In 2008, for example, it made a close flyby of the asteroid Steins. And in 2010, it swung by the asteroid Lutetia, giving astronomers an unprecedented look at the huge space rock. Comets are among the most primitive objects in the solar system, so researchers hope Rosetta's observations can help them reconstruct the early history of our cosmic neighborhood. The mission will also look for organic molecules on 67-P/Churyumov-Gerasimenko's surface, to investigate the possibility that a long-ago comet strike could have seeded Earth with the building blocks of life. The European Space Agency leads the Rosetta mission, with some contributions from NASA.